This mouthwatering take on a classic combo is guaranteed to impress. If you’ve found yourself in a bit of a recipe rut lately, this flavour-laden roast is the answer. This dish from chef Curtis Stone features a classic combo of apples and pork — and with the addition of three simple ingredients, you’ve got yourself the perfect family dinner. 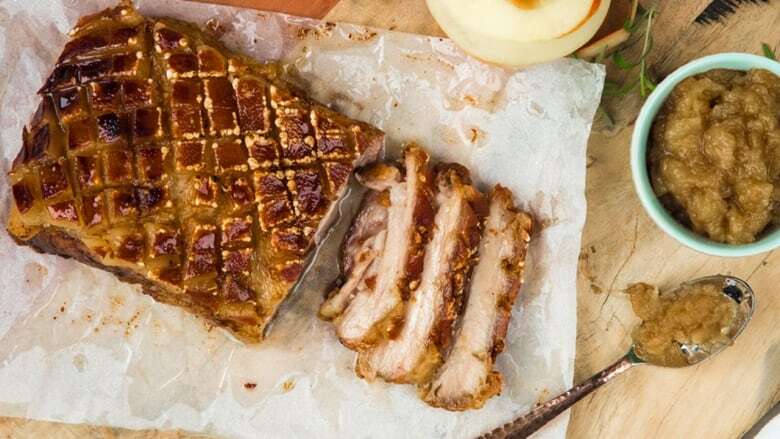 The pork belly is super tender, the skin gets nice and crispy and the apples form a caramelized apple sauce to serve as the perfect accompaniment. Curtis stopped by The Goods to share this family classic that is guaranteed to impress. Position racks in centre and lower third of oven and preheat oven to 150C or 300F (130C or 266F fan-forced). Using sharp knife or box cutter, score skin and fat of pork (do not cut through meat). Rub 1 1/2 tsp sea salt flakes into scored skin and fat. Season rest of pork meat with more salt. Place wire rack on rimmed baking tray. Set pork belly, skin side up, on rack. Place pork on centre oven rack and roast for 3 hours, or until pork is fork-tender. Remove from oven. Increase oven temperature to 250C or 482F (230C or 446F fan-forced). Return pork to top oven rack and roast 30 mins, or until skin is crackling and crisp. In a heavy large saucepan, stir the apples and cloves over medium-high heat for about 5 minutes, or until the apples just begin to soften and caramelize slightly. Decrease heat to medium-low. Add Calvados to apples and stir for about 5 minutes, or until liquid has reduced by half. Cover and cook apples, stirring occasionally, for about 8 minutes, or until apples are tender and most of juices have evaporated. Remove saucepan from heat. Using a potato masher, coarsely mash apples. Stir in enough sugar to sweeten compote slightly. Carve pork and serve with compote.